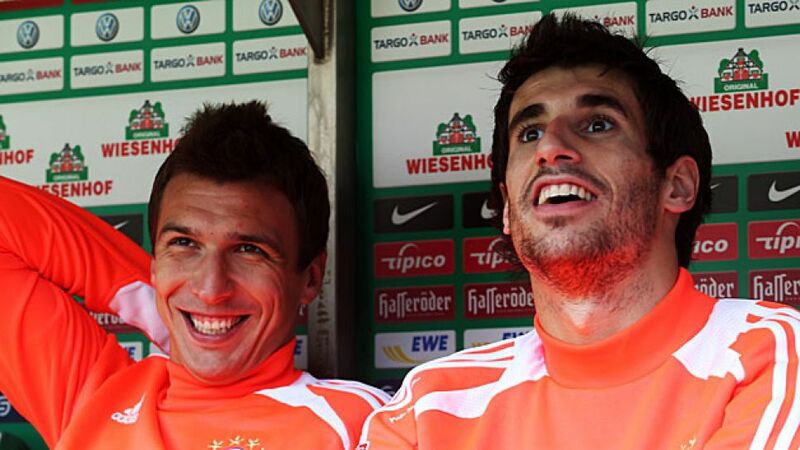 It was the turn of Mario Mandzukic (l) and Javi Martinez to be left on the bench as Bayern coach Jupp Heynckes once again rotated his side. Munich - Bayern Munich made it six wins out of six with two late goals seeing off Werder Bremen at the Weser-Stadion. Bremen had managed to hold the runaway league leaders for 80 minutes, but just one lapse in concentration let in Luiz Gustavo to put Bayern in front. Mario Mandzukic, who started the game on the bench, sealed the win two minutes later as Bayern continued their perfect start to the season. Claudio Pizarro was the latest beneficiary of Bayern coach Jupp Heynckes' rotation policy as Mandzukic was given a break and the former Bremen striker was chosen to lead the Bayern line. He did not see too much of the ball early on, though, as Bremen attacked with Eljero Elia and Marko Arnautovic both whipping in dangerous crosses which found no takers. Bayern searched for Pizarro with high balls, one of which the Peruvian almost made count in the 12th minute, but he was not quite able to get enough power or direction on the ball to truly test Sebastian Mielitz. The Bremen goalkeeper was having a surprisingly quiet afternoon between the Bremen posts, and when he did fish the ball out of his own goal in the 31st minute, he was able to place it on the edge of his six-yard box to restart play: Dante's header, which went in off the post, was ruled out for offside. Franck Ribery had had a pretty quiet afternoon in the first half, but clearly he was saving his best for the second 45 minutes. Only four minutes into the second half, the Frenchman twisted and turned his way past Clemens Fritz before seeing his shot cannon off the inside of the post. At the other end, Kevin de Bruyne tested Manuel Neuer in the 54th minute with a shot from 25 yards which the Germany international collected low down to his left. But it was Ribery who continued to pose the greatest threat. He was unable to get a shot in on goal from the goal line and then sent a 20-yard effort just inches wide of Mielitz's goal as Bayern started to get into their imperious rhythm. Mandzukic was brought on, as was Martinez, as the Bavarians stepped up their search for an opening goal, which they found in the 81st minute. Thomas Müller squared the ball to Luiz Gustavo, who did not need a run up as he lifted the ball over Mielitz from 25 yards. Bremen responded immediately and earned a corner, but no sooner had Bayern cleared the danger, they had doubled their lead. Ribery sent Xherdan Shaqiri down the left wing and his low cross was an invitation for Mandzukic to put the result beyond doubt from close to the penalty spot.